Your Austin dermatologist gives helpful advice for how to best protect skin against skin cancer. With summer right around the corner and the idea of BBQs, beach days and outdoor sports on your mind it’s important to also remember to protect your skin. More than 1 million people are diagnosed with skin cancer in America each year. Currently one in five Americans will develop skin cancer at some point during their lifetime. Your Austin, TX dermatologists at Central Austin Dermatology offer up some skin care tips to protect yourself from life-threatening melanoma. Wear sunscreen everyday, all-year round. Choose a sunscreen with at least SPF 30. Your sunscreen should protect against both UVA and UVB rays. Wear sunscreen even on cloudy days, when you can still get burned. Say “no” to tanning beds: More and more studies are sharing the negative effects that tanning beds have on your skin, so this shouldn’t come as much of a surprise. Since tanning beds emit UV rays, every time you get into that tanning bed you are increasing your chances of skin cancer. Global studies have found that people who use a tanning bed before 35 years old increase their chance of melanoma by as much as 75 percent. Your Austin, TX dermatologists recommend avoiding tanning beds altogether. Wear clothes that protect: While your sunscreen will certainly go a long way to protecting you while outside, it won’t offer complete protection from harmful UV rays. Also opt for dark, tightly woven clothing that covers your arms and legs. Always wear sunglasses while outside and a hat with a large brim to keep sun away from your face. You can even purchase photoprotective clothing. Avoid the sun during peak times: The sun’s rays are strongest between 10am and 4pm in America. Therefore, try to schedule your outdoor activities for before or after these peak times. This includes cloudy and winter days, as well. Clouds do not offer protection from the sun’s rays! Less time spent outside during these hours means less of a chance that you’ll be dealing with a painful sunburn. 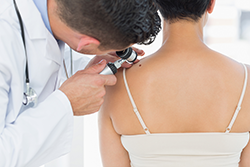 If you have a family history of melanoma or if you are noticing any skin changes including new or suspicious moles, then it’s time your dermatologist checked you out. Schedule an appointment today with Central Austin Dermatology! Whether you are an existing patient or searching for a dermatologist in the Austin, TX area, we’re excited you are here. With the dermatology industry advancing, we recognize the importance of keeping our patients and visitors up to date with all of the new and exciting things taking place in our practice. As always, feel free to contact Central Austin Dermatology with any dermatology questions or concerns.